We used this program to populate and edit our database of contributions to this website. You can use the first two grids to add, delete and edit records. The demonstrations in the following sections provide read-only access to this data. a navigator linked to each data source. the corresponding components of type TDBNavigator (dbnavProgrammer, dbnavPrograms and dbnavCombined) with DataSource property set to dsProgrammer, dsPrograms and dsCombined, respectively. When the Connected property of the connection and the Active properties of the transaction and queries are True you can see the data in the grids at design time. The delete button of each navigator did not meet our needs so instead you can run our own scripts via Delete buttons. (If you want to use more of the inbuilt functionality of the DBNavigator with a single short block of code for applying the updates to the database, see a later page on SQLite or Firebird on a Raspberry Pi). Use the + button of the navigator to add a record. You can use the last button of the Programmers and Programs navigators to refresh the data after attempting to commit changes by clicking an Update button. You can then check that the data has been accepted and has not contravened any of the constraints. For example, the age must be greater than 10 and less than 20. We understand that use of the argument 1 in our code sqlqProgrammer.ApplyUpdates(1); causes a single exception to be suppressed. (Use of the value 0 instead of 1 had resulted in an occasional irritating error message that could be ignored without repercussions). We do not complicate the program with error-trapping routines. You can click on column headers to sort by that column. The SQL code to achieve this is simple. You can carry out a search to match only part of a field with the LIKE keyword together with required letters and the wildcard % which matches any sequence of letters. For example, the expression Forename LIKE A% matches all forenames that begin with a capital A. 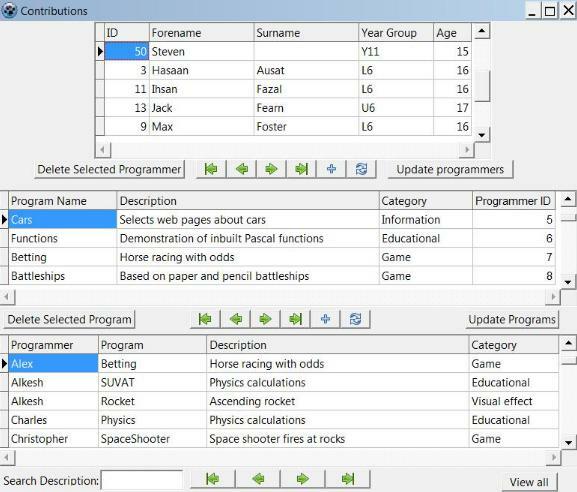 In this demonstration you can use wildcards to search the descriptions of contributions. We supply the source for all demonstration programs and the database Contributions.fdb in db_contributions.zip. The Firebird demonstrations are set up with the database in the F:\Firebird directory, so put it there or change the DatabaseName property of the connection to its filepath on your system. The demonstrations need either Firebird server to be running or the embedded Firebird files (fbclient.dll etc.) to be in your program folder. This web tutorial was useful for writing Lazarus applications that use the Firebird database.